"Camp" at the Great Derby Social. Photo by Knockout. 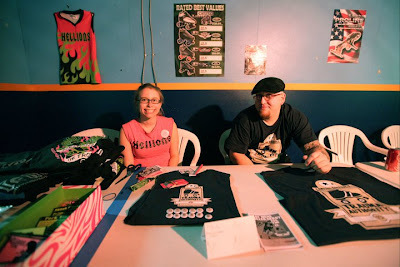 Teams were also able to set up merch at the event. I set up next to Bear from Capital District Men's Roller Derby (CDMRD). Knockout and Disharmony were eager to get on their skates and sign up for scrimmaging. I, on the other hand, had taken a hard hit to my shoulder a couple days before and was hurting. I didn't end up skating in any scrimmages, but I did do a bit of open skate. I did do a lot of socializing, though! I met some mad cool peeps that weekend, including dudes from the Burlington Bombers! Yay for broller derby. Men's scrimmage at the Great Derby Social. For the scrimmages I decided to help NSO. I got to be the penalty box mistress. 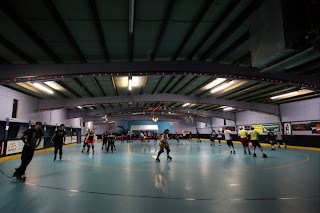 There was also a junior derby league there (I forget which state they were from...) but I helped a couple of their players learn how to work the box (er, poor choice of wording? sorry). When the girls we're NSOing with me, they were kicking as on the track - those junior derby girls will be amazing once they're of age to skate on a women's team! 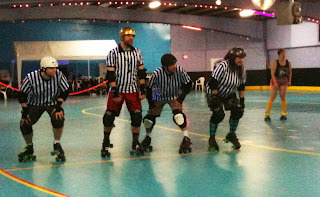 Ref race at the Great Derby Social. Other fun events including referee races and other skating games (dodgeball - ahhhh). I wish there had been more frequent scrimmaging, though. Sometimes the scrimmages were only 20 minutes long - then a break of a couple hours until the next one. This was the first time though, so I imagine next time it will be a bit more organized. One thing I would like to compliment is that the organizers made sure there was enough food and drink for everyone! The event was somewhat of a potluck, but there was more food available beyond what everyone brought, which was great. Because we are crazy, Disharmony, Knockout, and I headed out in the wee hours of the morning (the event was supposed to last until noon on Sunday). Since most leagues in attendance seemed like they were from the general area, many left around midnight. We were tired and kind of looking forward to sleeping in a bed. 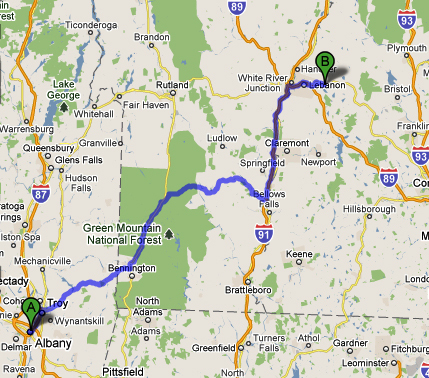 So we made the trek back to Albany around 4am. Disharmony, our amazing driver, got us safe and sound back to Albany and I think the three of us hit our pillows like a ton of bricks. 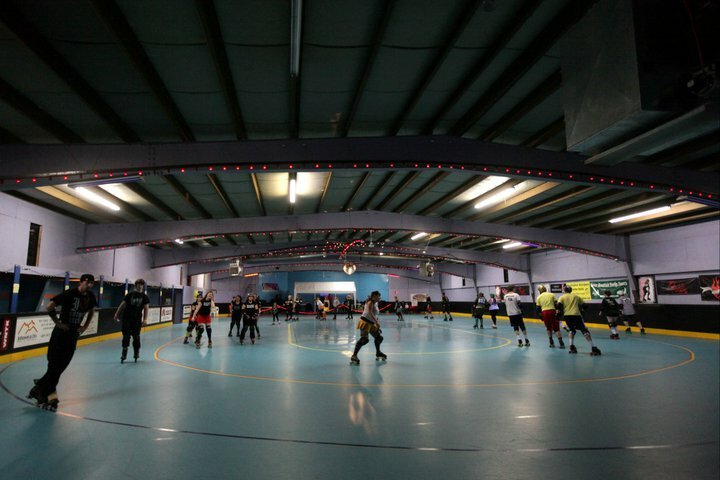 Then we went to practice that Sunday night because we are amazing (and like I said, crazy - about derby that is).